Palmitoyl Tripeptide-5. 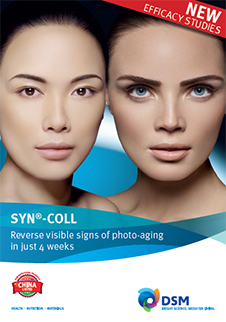 SYN® -COLL by DSM acts as an anti-aging, anti-wrinkle and rejuvenating agent. It is a patented, synthetic tri-peptide, based on glycerin. It helps to slow down the skin aging process and reverses photo-aging damage. It boosts collagen production and protects against collagen degradation. It offers lifted, sculpted look and refines pore appearance for smoother & younger-looking skin. Moreover, it offers improved skin firmness, elasticity, texture and smoothness. SYN® -COLL finds application in formulating facial- and body care products. It has a shelf life of 48 months.